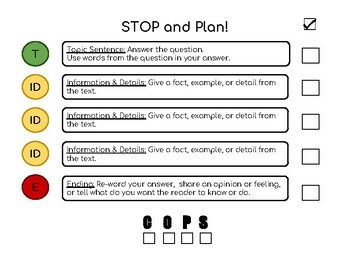 Using a combination of the "stoplight" paragraph organizer, "TIDE" organizer, and the COPS editing strategy, I use this checklist to help my students transition from the stoplight organizer to using the more advanced TIDE method of paragraph organization. This checklist is really helpful for my students with Language-Based Learning Disabilities, for whom completing an organizer and then going on to write the information again is extremely tedious and frustrating. It keeps them organized while only having to write the information once. It also provides a "one-stop" organizer that includes editing so that they do not have to manage multiple sheets of paper. Check out the rubric I have that accompanies this organizer! Use the rubric to give students specific feedback about their paragraphs and to help them see growth in their writing!